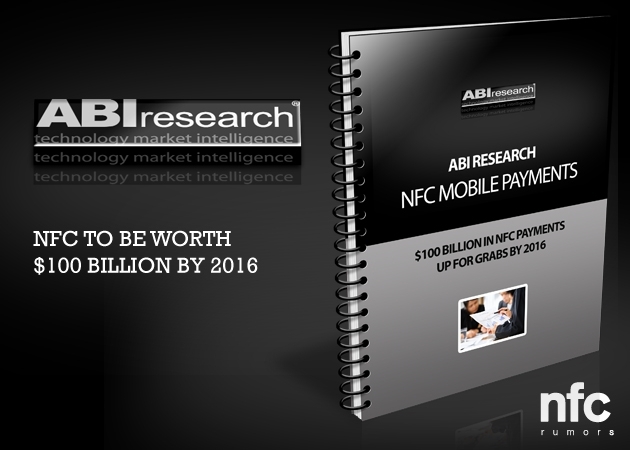 A report compiled by ABI Research has revealed that the total value spent via NFC mobile payments will climb from this year’s estimated $4 billion to $100 billion in 2016, with that figure expected to jump to $191 billion by 2017. ABI Research’s report entitled “Mobile Payments, NFC, and Contactless Convergence,” posits that the surge in NFC mobile payments will likely stem from the merging of payment types— proximity, P2P and online— onto a single NFC handset. This integration of technology could also act as the catalyst for convergence across a number of other markets like ticketing, retail, loyalty and access control. Though market convergence is not yet a reality on the mass commercial level, ABI feels that the value of NFC is evident. Market convergence will create ripples throughout the payment landscape and would benefit a number of stakeholders including smart card and IC vendors, device OEMs, MNOs, partnering service providers and payments networks. ABI predicts that market convergence is still 2 years out, and that the first markets to take advantage will likely be transportation and ticketing. The report estimates that some 26% of all NFC handsets will house a contactless ticketing application by 2017. The delay in market convergence is, in part, a product of incomplete business models. Current pricing structures make market entry and investment a complicated ordeal for potential partners— as evidenced by MNOs lack of large-scale investment in NFC-enabled phones. Read the full ABI Research article and report here.